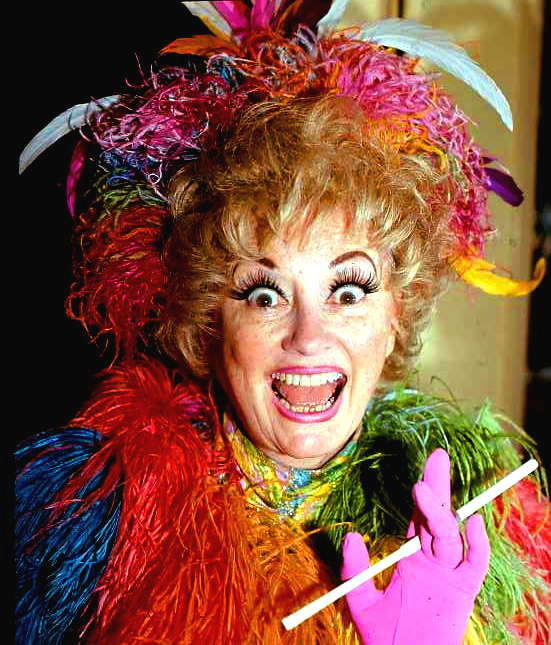 Phyllis Diller was born in 1917 and, God bless her, died at the age of 95 in 2012. She passed at her Brentwood home with her family surrounding her. They told reporters she died with a smile on her face. Phyllis was considered a pioneer because she was a unique female entertainer and was part of a group of comedians called New Wave comics. The New Wave comedians became famous after WWII and were unconnected to vaudeville. Phyllis, who was a housewife for many years, designed her stand up routines around housewifery. Although she'd done work in entertainment for a few years before she devised her act, she didn't perform stand up until 1955. She had six children from her first marriage to Sherwood Diller, which may be what gave her the wild hair she was famous for. She says her fictitious husband, Fang, present in all her routines, was not inspired by either of her husbands. It's a good thing, because Fang was sloooow in the brain. She credited her success to three things: Bob Hope discovering her (she made three films with him, including Sorry, Wrong Number) the metaphysical book The Magic of Believing (Phyllis did not believe in God or an afterlife), and very hard work and persistence. Diller was known for her self-deprecating jokes, unusual laugh, and her plastic surgery. She was unashamed and outspoken about her delight in plastic surgery! You'll get to experience two of these things and hear her talk about one in this Jenny Jone's interview from 1991. Enjoy! And here's a BONUS video of Bob Hope on a USO tour that included Phyllis, something she did with him often. She comes in at counter 41:53. So funny! Phyllis has a Wiki Page, and here are books about and by her on Amazon, including her autobiography Like a Lampshade in a Whorehouse (I can't help it, that's the title!) and The Magic of Believing by Claude M. Bristol.